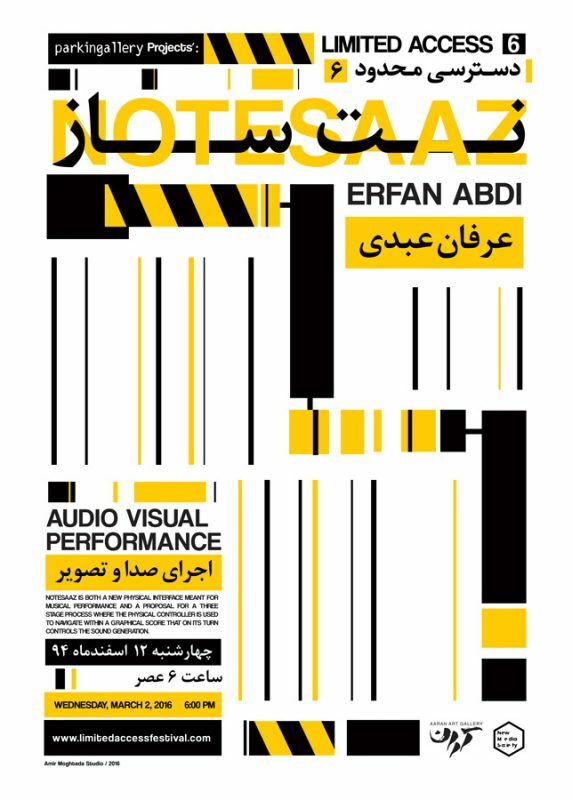 Last day of Limited Access Festival at Aaran Projects, we will have a special guest Erfan Abdi will share his Notesaaz experience with us with a short performance at the end. Erfan Abdi (1983 – Tehran) is an artist, designer and performer based in The Hague, the Netherlands since 2009. He graduated from the Masters program at the Artscience Interfaculty, Royal Conservatoire The Hague in 2011. Holding a Bachelor’s degree in graphic design from the University of Tehran (2006) he has a background in visual art and design, while he has also experimented with electronic music, video, computer programming and physical computing. He takes advantage of the possibilities offered by technology with a DIY attitude, and constructs his instruments from found or re-purposed material, seeking new ways of relating to the world of production and consumption. He researches the concept of active perception in the context of performing arts, and the interactions between performer, instrument and audience. Notesaaz is an instrument for live electronic improvisation that can be experienced through sound and image. It is both a new physical interface meant for musical performance and a proposal for a three stage process where the physical controller is used to navigate within a graphical score that on its turn controls the sound generation. By showing the dynamic score to the performer and the audience, Notesaaz shows new possibilities for staging the performer instrument relationship, inviting the audience to engage more in what is played and to anticipate on what happens next.